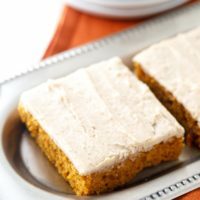 Pumpkin sheet cake is a wonderful fall treat, and our brown butter frosting really sends this delicious sheet cake recipe over the top. There are so many reasons to love sheet cakes! Two big perks for me are that sheet cakes are easier to frost and they are easier to cut than regular cakes. Plus, I love the cake-to-frosting ratio of a classic sheet cake. Have I ever mentioned that I’m a frosting junkie? 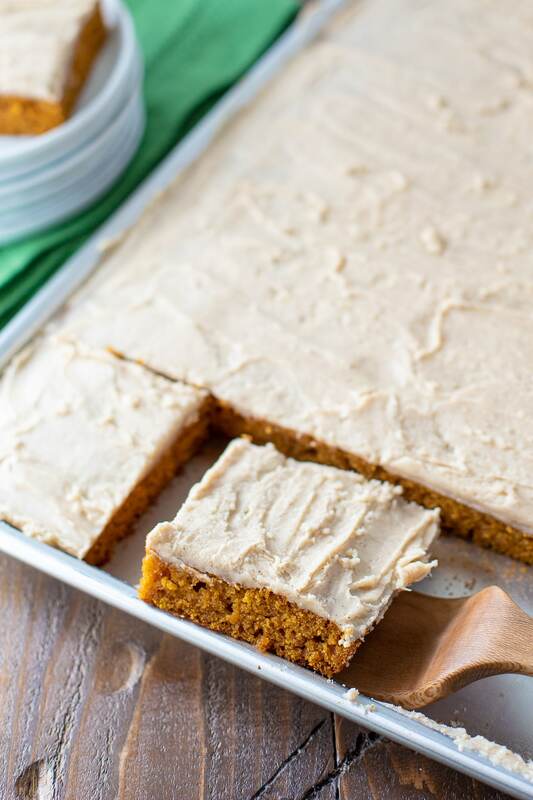 Pumpkin sheet cake plus brown butter frosting equals fall dessert heaven in my book. 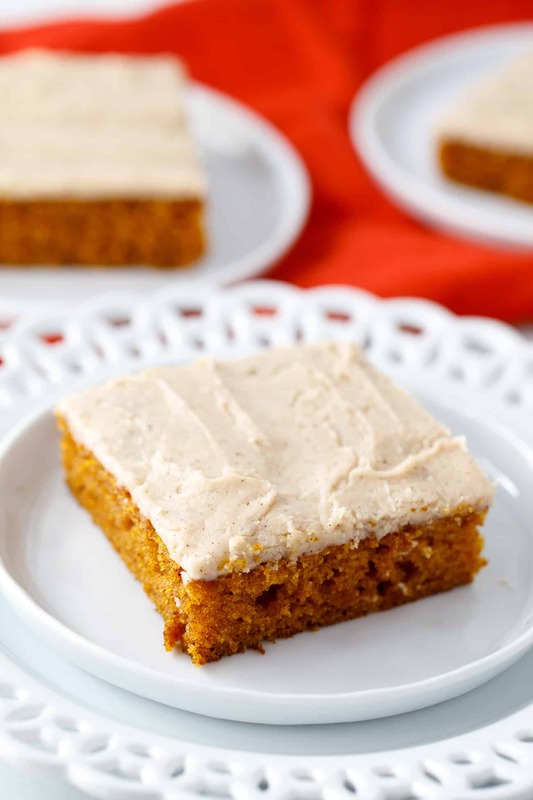 This moist pumpkin sheet cake recipe is full of delicious ingredients. 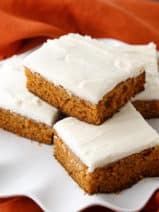 It’s pretty easy to tell just from this sampling of ingredients that this is the best pumpkin sheet cake ever. Don’t even get me started on that brown butter frosting, because it’s just SPECIAL. Sure, you could also use a cream cheese frosting for this recipe, but if you give my brown butter frosting a whirl I think you’re going to adore it. Brown Butter Frosting is totally magical! 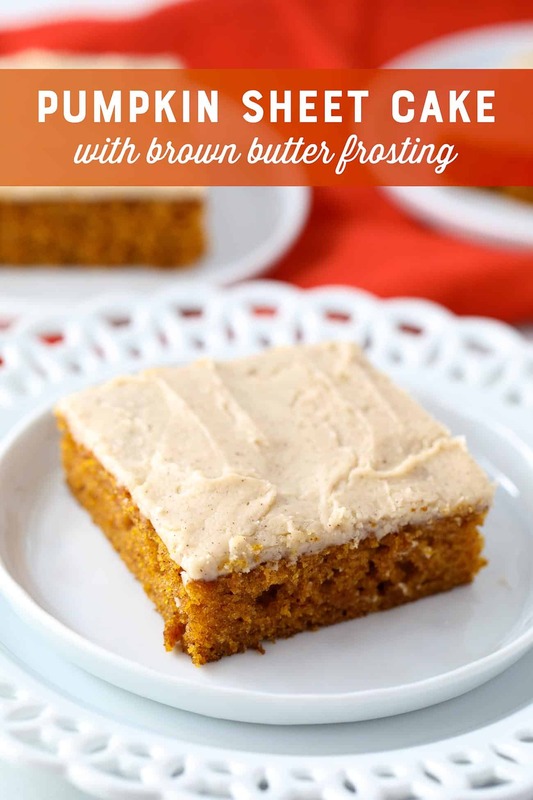 Browning the butter gives it a nutty, caramel-like flavor that infuses the frosting with so much incredible, rick flavor. It pairs so nicely with the pumpkin sheet cake. 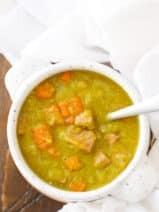 Honestly, this recipe is going to knock your socks off. 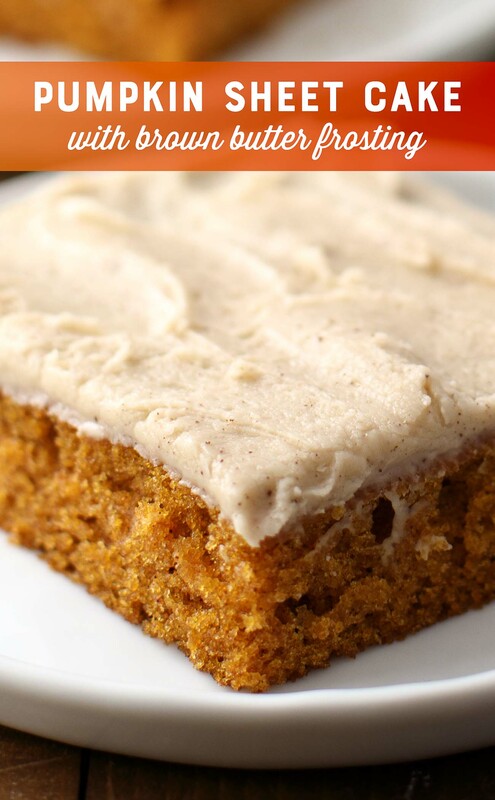 If you are a cream cheese frosting afficionado, don’t miss my pumpkin cupcakes and this pumpkin spice cake. Both feature cream cheese frosting recipes! You’re going to need a jelly roll pan when you make this pumpkin sheet cake. This is the one I use. I highly recommend this pan; it will last you a lifetime. 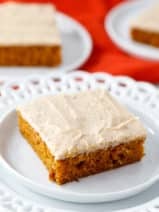 TIP: If you’re planning to serve this pumpkin sheet cake at a party or event, you can pre-cut the cake and place a pumpkin candy in the middle of each piece to add a little extra decorative flair! 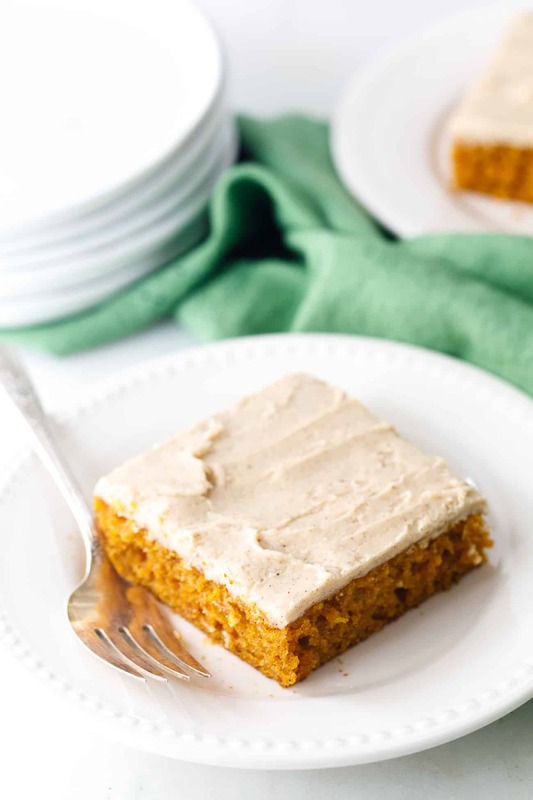 Sheet cakes are so easy to make, so why not try this simple and sophisticated pumpkin sheet cake with brown butter frosting this fall? You’re going to love it and so will your friends and family. I promise! 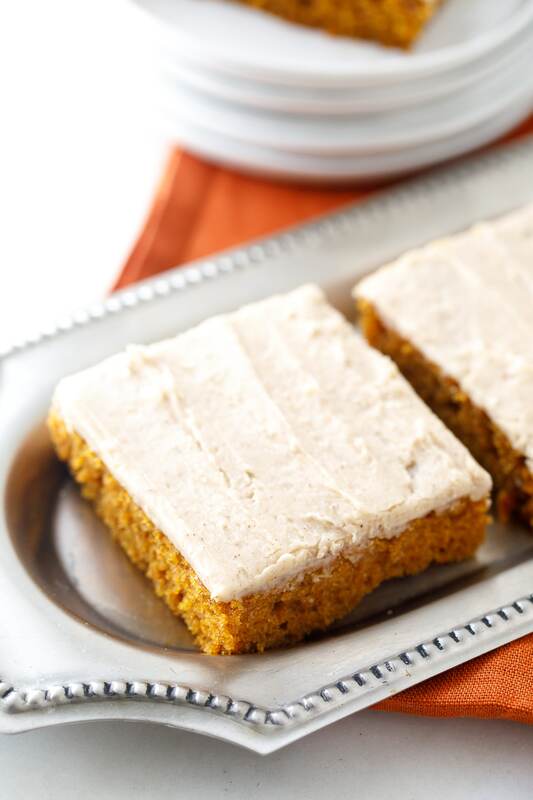 Our pumpkin sheet cake with brown butter frosting is loaded with sweet, rich flavor. Preheat oven to 350 degrees. 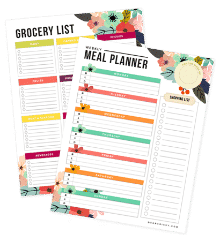 Spray a 12 x 17 inch jelly roll pan with non-stick cooking spray. Combine the flour, baking soda, cinnamon, and the salt; set aside. Pour into the prepared pan. Bake for 20 to 25 minutes or until a toothpick inserted into the center comes out clean. Mix together the milk and the vanilla and set aside. Add the powdered sugar to a mixing bowl and set aside. Over medium heat melt the butter stirring constantly. When the butter becomes very frothy and turns brown remove from the heat. Add the milk and the vanilla mixture to the powdered sugar. Add the browned butter. Mix with an electric mixer until well combined. Immediately spread on the cooled cake. For a thinner frosting add milk a tablespoon at a time until desired consistency is achieved. Loved this cake, so moist and delicious. Tricia is right, I also made one and a half times the icing everyone loved it. Thanks for the recipe. 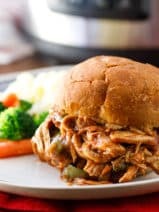 Can’t wait to make this.. can you make this ahead of time and does it require to be refrigerated? Thanks! This cake was a big hit and easy. Making again tonight for another party. Thanks for posting it. I made this cake for work. It was fabulous!!! Very moist. The only thing I would do next time is make one and half times the frosting it almost wasn’t enough for the whole cake. I cannot begin to tell you how excited I am to make this sheet cake! 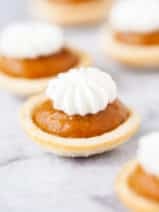 I love pumpkin everything and I thought I had every pumpkin recipe out there! I’ll bet the brown butter icing makes it even better! Can’t wait to try! Thanks for sharing!